Freight is the economy in motion. As the greater Charlotte region continues to grow, its economy becomes more diverse and consumes an even wider range of goods and services. This growth is supported and enhanced by a reliable multi-modal transportation network. The movement of goods continues to be an essential building block of the region’s economic competitiveness. 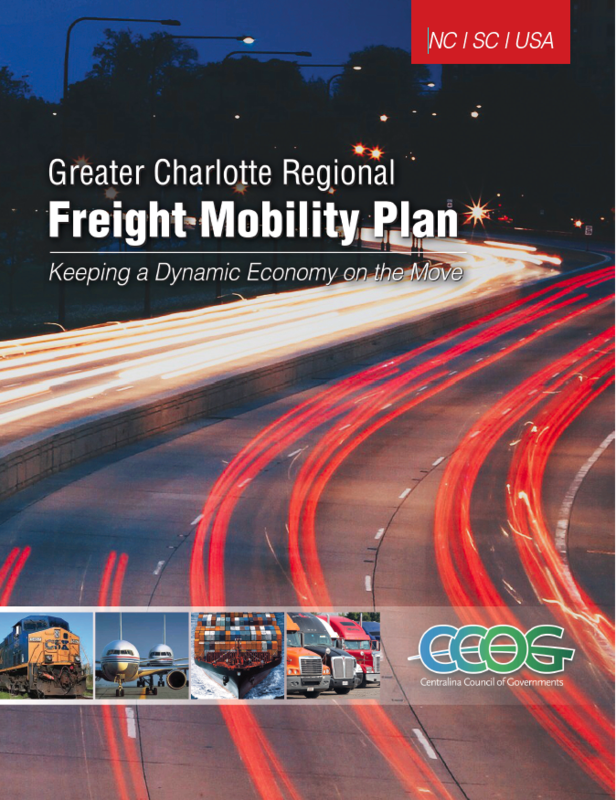 Centralina Council of Governments, in collaboration with regional partners for the 14-county Greater Charlotte Bi-State Region, developed the region’s first Freight Mobility Plan to support the region’s communities, transportation planning organizations, and manufacturing and logistics industries. The region’s freight transportation system is a network of interstates, highways, local roads, railways, and pipelines. This network is tied together by inter-modal yards, airports, and other transportation facilities and it provides the means for the movement of raw materials and finished products from all sectors of our economy. The Freight Mobility Plan serves urban, suburban, and rural areas of the region by aiding in the understanding of current and future levels of freight network activity, identifying issues and opportunities, defining feasible solutions supported by the private sector, identifying new technologies to improve freight flow and attract new businesses to the region, and guiding the region’s investments in freight infrastructure. To ensure the region’s strong economic future and economic competitiveness this region must collaborate to address its current and future freight transportation challenges. A key foundation of the plan has been collaboration and engagement of public and private project partners to guide and inform the process and outcomes to ensure the Plan is comprehensive, responsive and meets regional needs. The project is a multi-jurisdiction public-private collaboration effort lead by CCOG in partnership with the region’s Metropolitan Planning Organizations (MPOs), Rural Planning Organization (RPO), Federal Highway Administration, U.S. Department of Commerce Economic Development Administration, N.C. Department of Transportation, S.C. Department of Transportation, local governments, economic development commissions, and private rail and trucking companies, logistics and distribution firms. The Greater Charlotte Regional Freight Mobility Plan was informed by three committees: a Coordinating Committee, a Steering Committee and an Advisory Committee. Centralina COG and project partners have been hard at work putting the Freight plan into action. On September 15, 2017, the Greater Charlotte Regional Freight Summit was held to educate stakeholders about our initiatives and hear how we are implementing the plan’s recommendations to ensure safe, reliable, efficient and sustainable freight mobility to support the Charlotte region’s economy and quality of life. A panel of experts presented about freight’s impact on economic growth, disruptive technologies for the industry, and new connections being made. Working with our project partners, Centralina is conducting education and outreach activities to continue the freight mobility discussion and to encourage the plan’s recommendations be considered and incorporated into local, regional and state planning documents and activities. To begin, Centralina will continue to coordinate with the region’s transportation planning organizations: Cabarrus Rowan Metropolitan Planning Organization (CRMPO), Charlotte Regional Transportation Planning Organization (CRTPO), Gaston-Cleveland-Lincoln Metropolitan Planning Organization (GCLMPO), Rocky River Rural Planning Organization (RRRPO), and Rock Hill-Fort Mill Area Transportation Study (RFATS). In May 2017, Centralina hosted regional meetings with local government and economic development staff to share local and organization specific recommendations from the Regional Freight Mobility Plan. Two priority recommendations from the Regional Freight Mobility Plan are being investigated by a CCOG-led Champion Group. Staff from FHWA, NC & SC DOT, City, County and other system creators/users are investigating the region’s Intelligent Transportation System (ITS) and Traffic Incident Management (TIM) system’s current capabilities, region’s future needs, current and future gaps, and to make recommendations for improvement and investment into these two regional systems. ITS enhances efficiency of the transportation system through the integration of advanced communications-based information and electronic technologies through transportation infrastructure and vehicles. TIM enhances productivity and safety of the transportation system through a planned and coordinated process to detect, respond to, and remove traffic incidents and restore capacity as safely and quickly as possible. 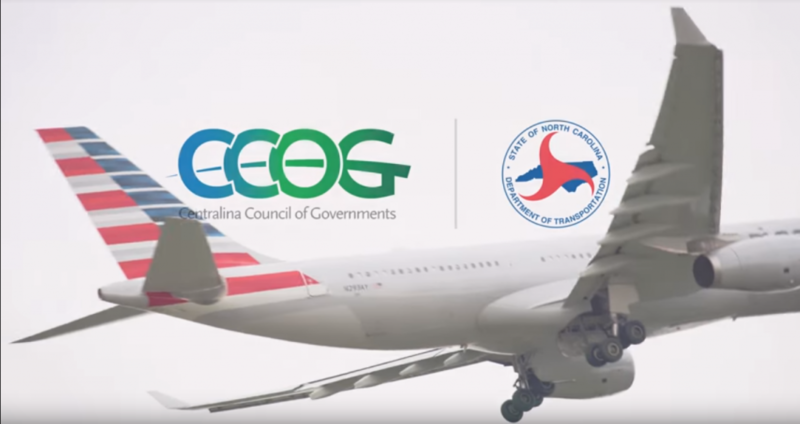 Members of the Coordinating Committee are staff members of the region’s transportation planning organizations, the North Carolina and South Carolina Department of Transportation, and state divisions of the Federal Highway Administration. More information about upcoming meetings and past meeting materials can be found on the Coordinating Committee’s webpage. The Freight Mobility Steering Committee is comprised of key regional experts in transportation and land use planning, economic development, logistics, and local government elected officials. For more information about past meeting materials please click here. Members of the Advisory Committee are private freight systems providers such as rail, trucking, and air cargo firms and freight systems users such as manufacturers, distribution and warehouse centers, and logistics firms. More information about upcoming meetings and past meeting materials can be found on the Advisory Committee’s webpage. On November 13, 2015 two peers to the Greater Charlotte Region traveled to Charlotte to present how their region’s were using freight planning to strengthen their regional economies and support economic development. Members of the Greater Charlotte Regional Freight Mobility Coordinating, Steering and Advisory Committees and others had an opportunity to hear about the Greater Cincinnati and South Florida regions efforts in freight planning. In addition the North Carolina and South Carolina Departments of Transportation presented an update on their State Freight Plans. To learn more about how to support this important project, please contact Jessica Hill, Project Manager at (704) 348-2731 or jhill@centralina.org.